As I mentioned in last nights post I love attending quilt shows. I shopped the vendors purchasing from Quilt Essentials in Auburn, ME and Rainbow Dyes also in Auburn. From Quilt Essentials I bought more Radiance, black and sage. While these aren’t for the same project they are pretty together and I see some Misty Fusing in my future. From Rainbow Dyes three bundles of half yards came home with me pinks, oranges and yellows these are bright and I can’t wait to stitch them up. The quilts were outstanding! 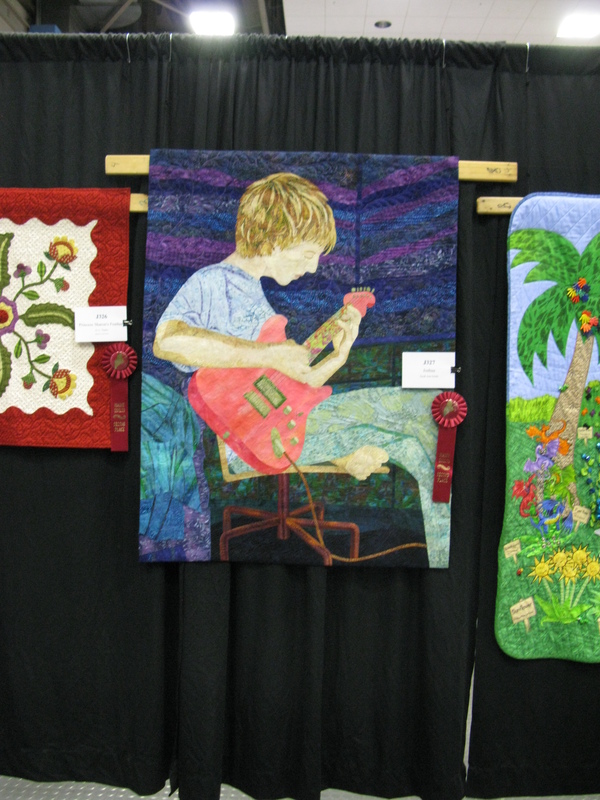 Margaret Solomon Gunn won best of Judged Quilts. I met Margaret, her mom and daughter on Sunday afternoon. Simply delightful! Margarets daughter asked for the camera to take photos of the quilts and apparently she does a great job. She’s quite a delightful young lady. Margaret added crystals to the back of the quilt. The stories behind the quilt are always as interesting as the quilts themselves. 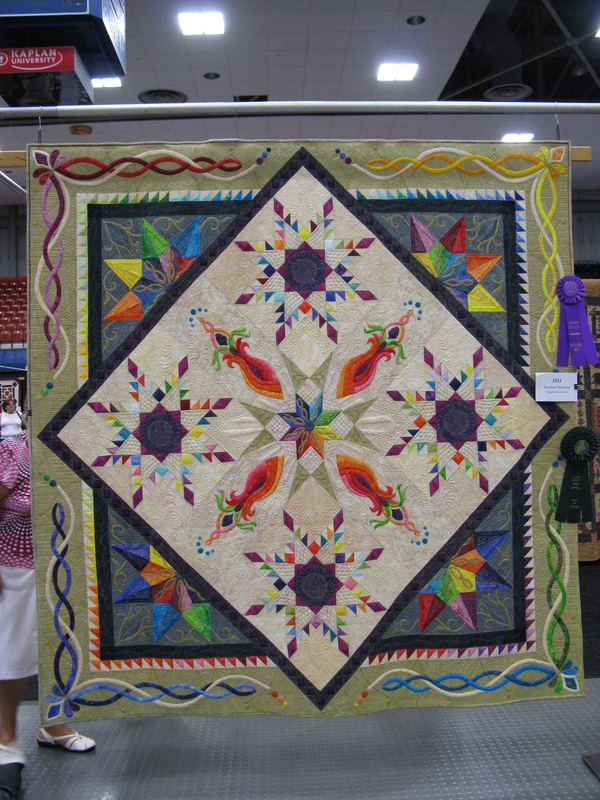 Sarah Ann Smith also won a ribbon with this amazing quilt! I love the detail quilting in this quilt. Sarah and I missed each other by this [ ] much. We’re planning on dinner in Houston at Quilt Fest where we’re both teaching in November. Had lunch with Mickey DePre, Linda Hahn, Janet-Lee Santeusanio and J-L’s friend Jackie. We laughed ate and chatted with a few of Mickey’s students who came back early to work on their free motion quilting prior to class starting again. Meeting quilters is the highlight of my time at any quilt show. This was no exception. Victoria Findlay Wolfe made the quilt for Quilt Alliance as part of their fundraiser. These quilts will be auctioned on ebay later this year. There were quilts from several facebook friends. Each quilt is unique and fits in some way the theme of “home”. There are two more photos and will share later this week: Carol Esch and Terri Stegmiller. 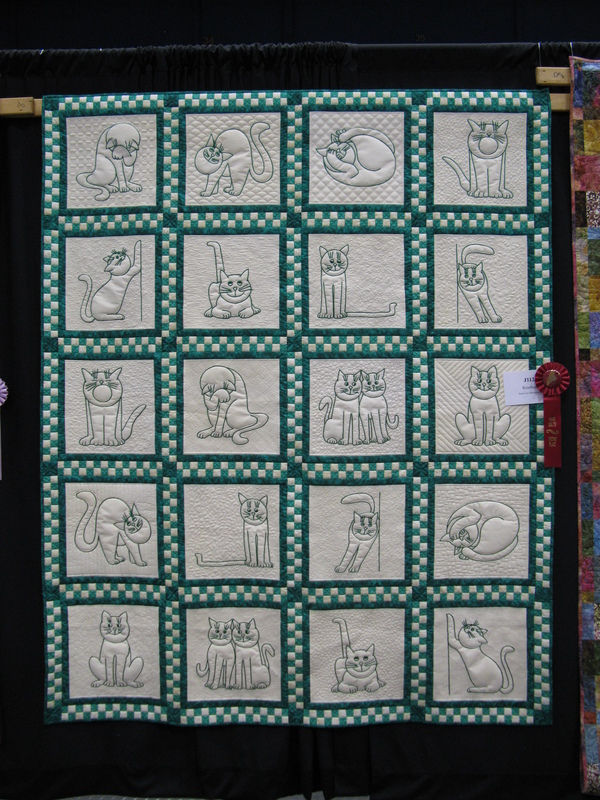 Janet-Lee entered this delightful embroidered and machine quilted quilt. I don’t remember the name of the quilt. I’m sure J-L will remind me. She brought home a ribbon for this quilt. Have a wonderful quilterly day! What fun! Too bad you missed Sarah Ann! She is such a delight!